The most laid back beach grill on the Outer Banks featuring bistro quality coastal comfort food all with a throwback to the surfboard shapers and wave riders on the break! The Shack has an inviting and warm old school driftwood atmosphere with an awesome sandy yard with outdoor games and tables located right on the Beach Road at Mile Post 9, just across from the Sand and Surf. Join us to chill out during your vacation or just an afternoon off. Relax and enjoy fresh locally caught seafood skillfully prepared by our Executive Chef Brett Owens. 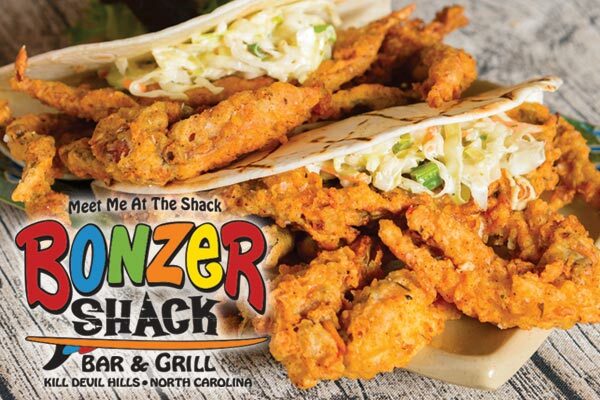 Brett brings a refined element to the soulful southern local food offered at Bonzer Shack. Enjoy a range of clever appetizers including the locally famous ‘Hippy Dip’ and wings roasted in house daily. The dinner menu features a range of tasty entrees including fresh tuna, mouthwatering prime rib, and juicy hand-pattied burgers.